Ask any event professional and they will tell you that targeted, efficient communication is a must have for organizers. Keeping your audiences informed and up-to-date throughout your event is now possible. 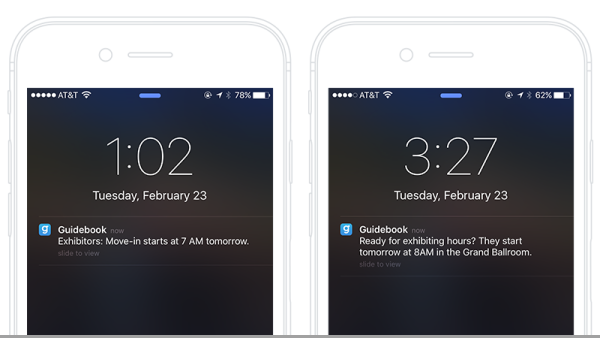 With Group Notifications, you can quickly and easily send relevant updates to specific groups of attendees at your event. Group notifications: reach any group of attendees with a single message. Send notifications instantly from one centralized user dashboard. Have a question? Reach out to sales@blog.guidebook.com/mobile-guides or call (650) 319-7233 to speak with a representative.